You’re not alone. There are many other peoplejust like you. You are probably seeking urgent solutions, and you have come to the right place. Often, having a new pair of shoes is not the real answer for combatting against plantar fasciitis. 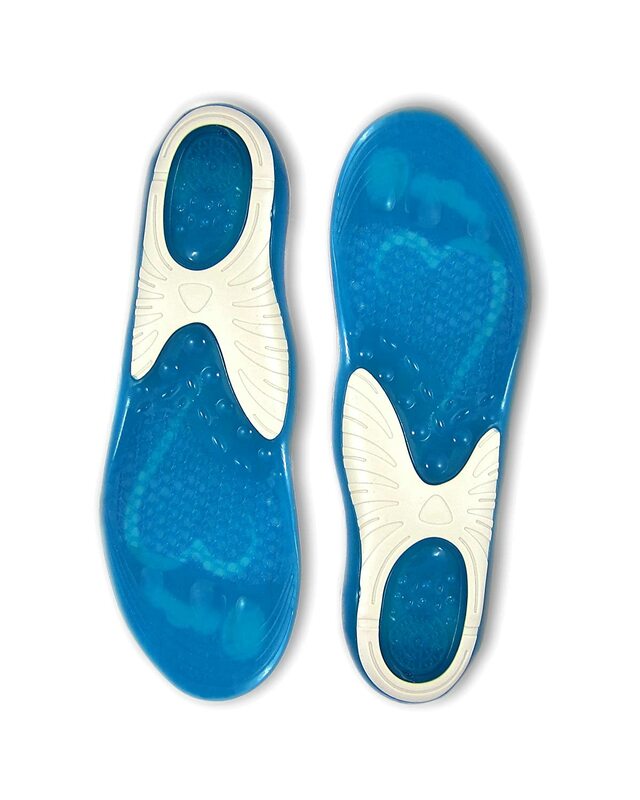 There is another approach that’s more reliable and practical – insoles. This article will introduce you to the best insoles for plantar fasciitis. Your feet deserve the best comfort and arch support. Having the right insoles allow you to realign your feet to their most comfortable position, usually neutral. This helps you avoid the pain brought about by plantar fasciitis. However, these insoles are only as good to the shoes that you use. Today, there are a lot of available inserts on the market, and you’ll likely have a hard time choosing from ground zero. But you don’t need to do that! Through in-depth research, we present for you the top ten insoles for plantar fasciitis. Before moving on, it’s important to know what you’re dealing with in the first place. Plantar Fasciitis is the Latin term for ‘inflammation of the plantar fascia’. This is a thick fibrous ligament that runs from the heel to the ball of your foot. Its purpose is to serve as a dynamic shock absorber as well as arch support. Consistent stress causes pain and inflammation in your plantar fascia. Many factors contribute to this including weight gain, fallen arches or overpronation, aging, and daily standing for a long time. 2 What makes an insole “great” for plantar fasciitis? 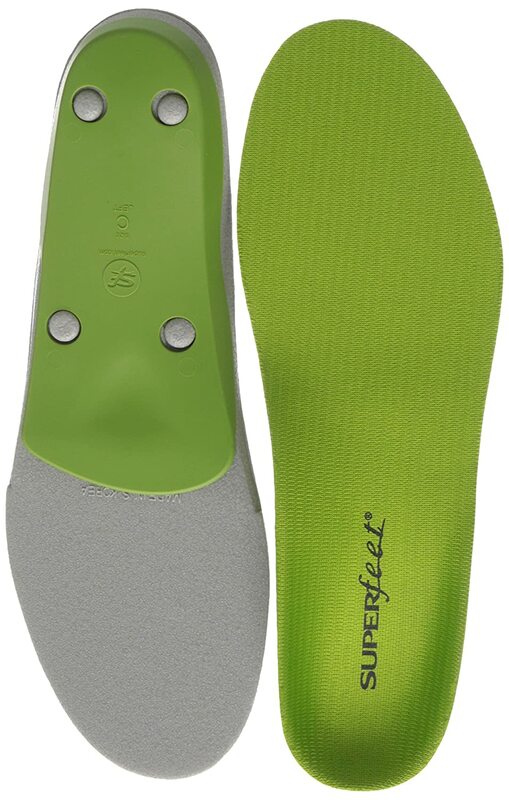 One of the most popular insoles on the market are the superfeet insoles for plantar fasciitis. First advertised in 1977, the most well-known Superfeet is the Green model which is less invasive than the famous Blue model. 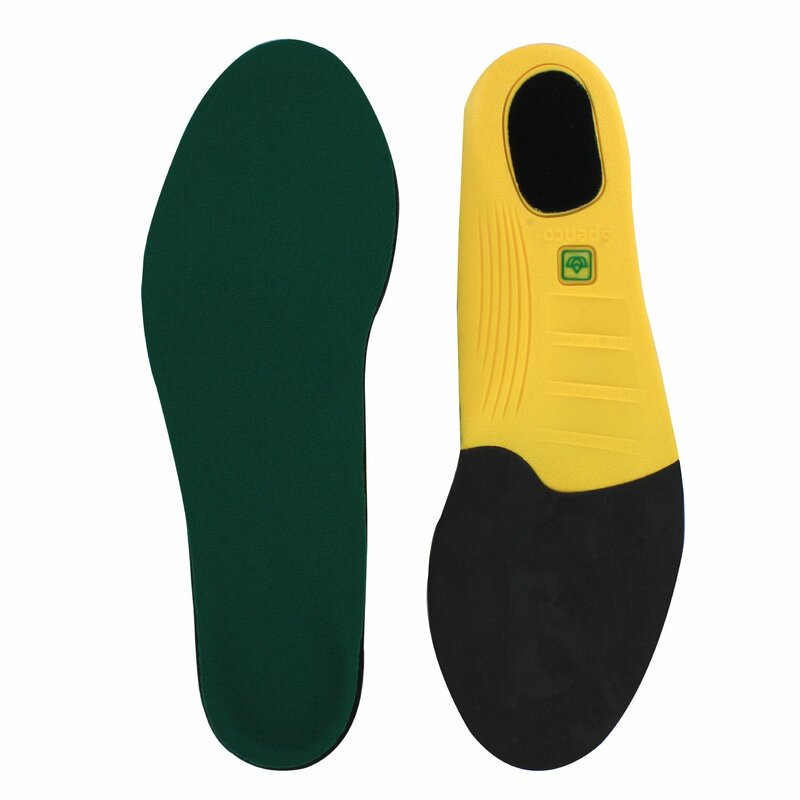 This insole is suitable for flat feet and is specially designed for low-medium arch foot types. If you are new to inserts, you should start with this one. The Black model is recommended for people with low or flat arches while the Green model is best for people who have mid to high arches. These inserts have a variety of shapes, making them versatile enough to fit in different kinds of shoes, even those with non-removable insoles. The Superfeet Premium Shoes Insoles are typically more expensive than other brands, but you’ll find some good deals on Amazon. Featuring Tri-Planar motion control, the Orthaheel Active is a smart choice. What makes this product credible is that it was invented by leading podiatrists who spent their time researching and integrating ideas to come up with this incredible product. 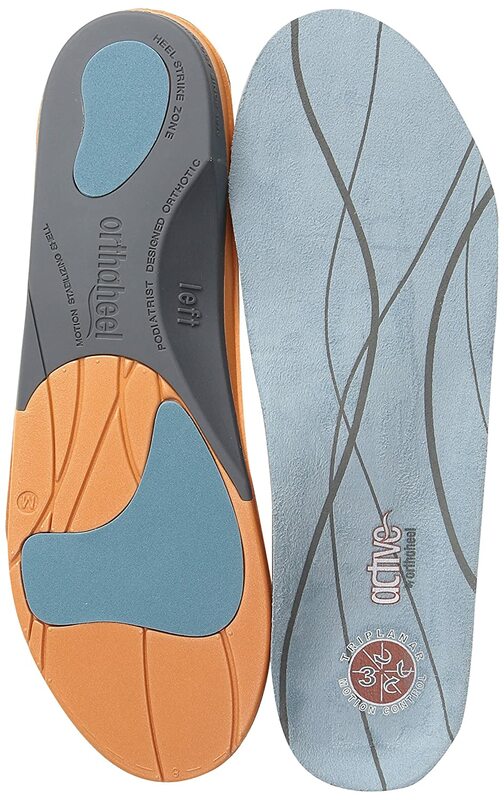 This insole decreases excessive pronation by realigning feet. As a result, you’ll get minimal leg and foot pain. A lot of users expressed gratitude towards Orthaheel for noticeable benefits such as soreness reduction when waking up. You can even wear these inserts in your walking shoes. They help you walk faster and straighter without the grim consequences of leg and back pain. 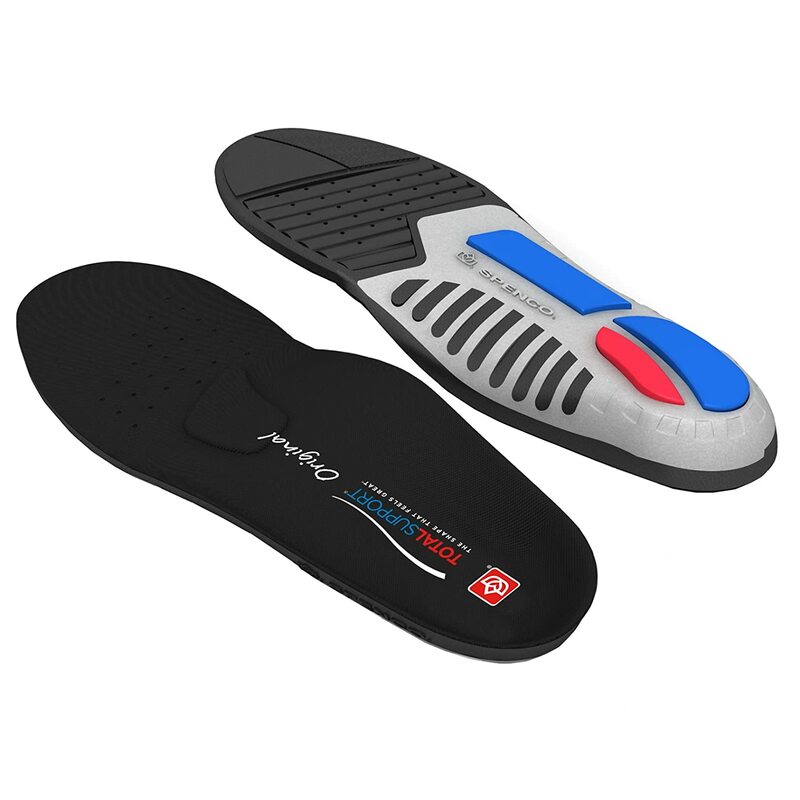 The Pro Tech Full Length is one of Powerstep’s pioneering insoles similar to Pinnacle (another orthotics from the same brand which is introduced next). It can provide a nice touch of flexibility and support for your arch. Greater comfort is also ensured through its shock-absorbent cushion which is made with double layers. What makes Full Length better than Pinnacle is that they are crafted with a heel pad that enhances comfort and cushioning further. Powerstep may not be as famous as the Superfeet brand, but they are in close competition. The Pinnacle is the second Powerstep insole that made our list. Maximum stability without sacrificing utmost comfort is the trademark of this product. Not to mention the plush cushioning and firm support that makes it on a par with the leading brands in the industry. 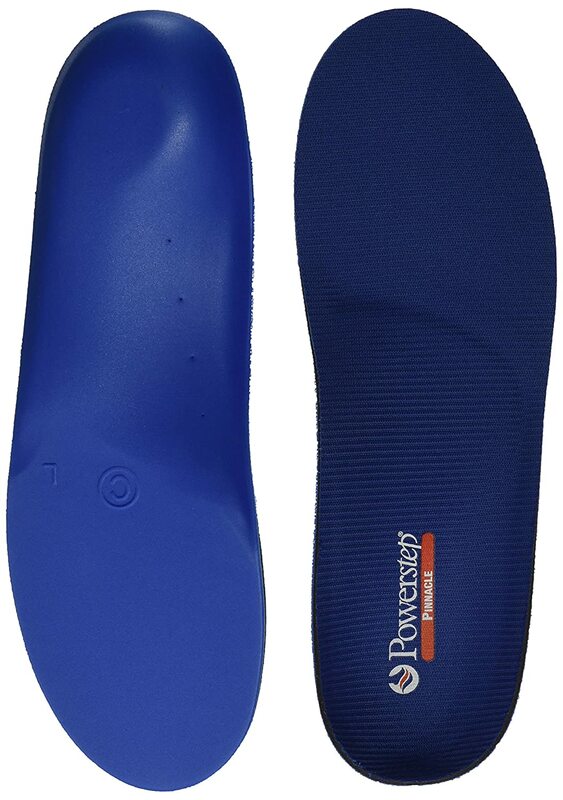 Bearing this in mind, the Powerstep Pinnacle is yet another remarkable insole for plantar fasciitis. The Polysorb Total Original is acclaimed to be Spenco’s best insole due to the stability and support. Take a look at the bottom part of Powerstep and compare it to this Spenco. The latter has more cushioning and particular pad add-ons to critical parts (like the heels and the middle part) while the former has none (or at least it doesn’t look like it has one). Spenco’s top choice design features the notable metatarsal dome, deep heel cups, forefoot crash pad, and semi-rigid cradle to fortify the comfort on your feet. This brand is often recommended to patients with plantar fasciitis. Syono Gel is the most uniquely made insole because it is made of, well, gel! However, not all people are comfortable when it comes to stepping on something soft but not made of fabric. 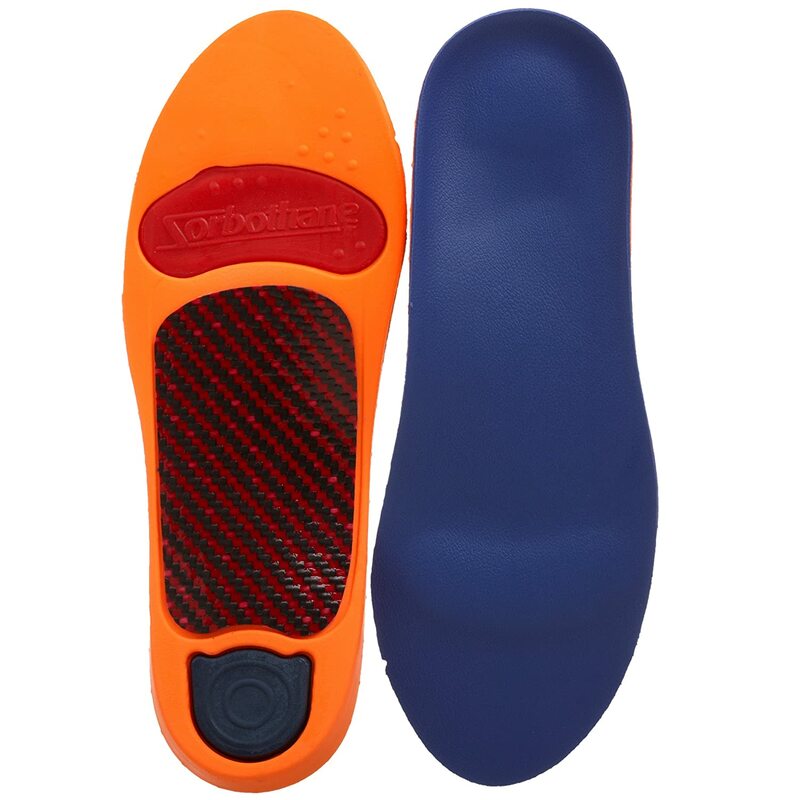 If you’re at ease stepping on a ‘gel’, then you’ll get along well with this insole from Syono. If not, you either have to force yourself to spend time with this orthotics until you’ve adapted or you just choose another choice. The blue gel material cushioning has its purpose – to give great comfort, especially in the forefoot and heel areas. Because of its multiple layers, it may cause a tight fit on some shoes. While prolonging your shoe life, this Spenco also aims to make you develop a better athletic performance making it ideal for sporty users. Spenco Polysorb Cross Trainer helps during hard activities with its lightweight arch and heel support mechanism. Through having the right cushioning, this insole discharges heel pain which you may encounter. The multiple layers of materials ensure durability without sacrificing comfort. Dr. Scholl’s found the main catalyst of foot and knee pain. In any athletic activity, your feet are subjects to an impact equivalent to triple your weight. That’s why it’s not surprising to experience pain issues. 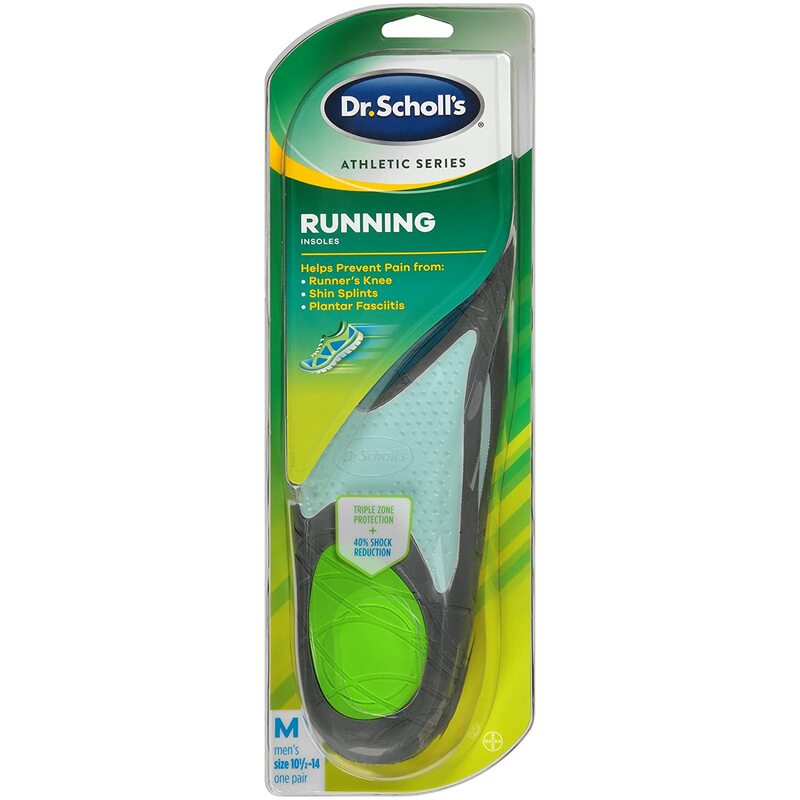 Dr. Scholl’s have crafted an orthotics capable of decreasing the shock that causes pain pain by up to 40%! The Active Series are mainly designed to lessen the stress posed by the triple-weight impact on your feet and legs. The Triple Zone Protection technology is the magic behind Dr. Scholl’s lighter heel and arch feel. The most interesting feature of the Airr Sof Sole is the slim design and enhanced shock absorption making it suitable for multiple uses as well as being compatible with a lot of running shoes. The insoles are partially made of polymer gel, particularly in the forefoot area, while the rest of the insole is made of other materials. Its shock absorbent feature is further boosted with the air chambers present in the heel and the arch. You might be missing something if you are not familiar with this brand. 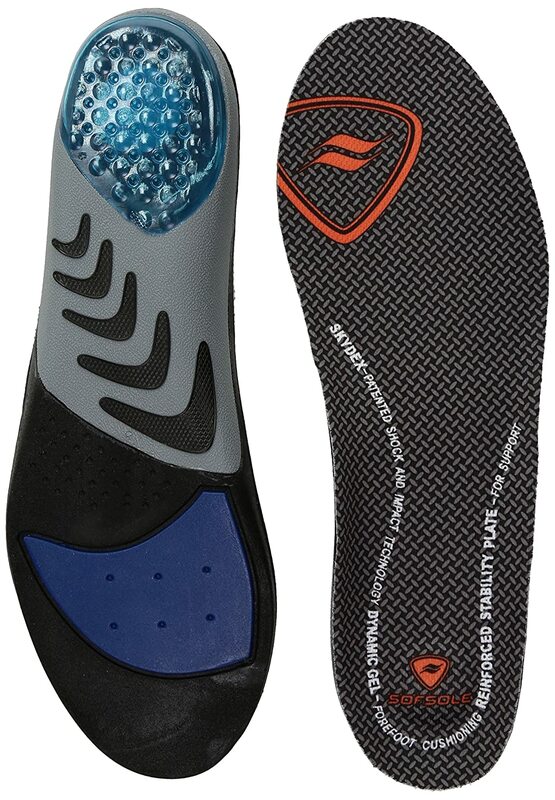 The Sorbothane is a reputable insole manufacturer. Their Ultra Graphite Arch insert is recommended for people who have substantial sporting demands. The Ultra Graphite Arch was designed to withstand the daily activities of its user even it means a lot of footwork (walking, standing, etc.). Also, these inserts can provide protection against stress while providing ample comfort into the bargain. What makes an insole “great” for plantar fasciitis? Ensure that you buy the proper type of insert that is perfectly compatible with your foot shape. It’s important to hear comments from other users who have already used a particular orthotic foot insert. In this article, User reviews are one of the ways in which we determining whether an insole is good or not. It is practical to buy for cheap insoles but don't expect them to last more than a few months. On the other hand, buying expensive insoles means you ‘get what you pay for’. For first time users, it’s not recommended to go for expensive orthotics right away. They may have useful features, but there it not guarantee they'll fit well with your particular foot condition. You might end up wasting money because you may need to purchase a new one. In the meantime, try to experiment with different brands and models and figure out which one is the most comfortable and most efficient for you. You can start with the featured products above. You can’t blame your insoles if they don’t last long. Imagine the stress they take being in contact with your feet which are always in motion all day long for seven days a week. Insoles are expected to wear down eventually even if they are claimed to be durable. Nothing lasts ‘forever’ but some insoles last longer. Maybe it's your first time to try on this so-called ‘insole’ from a particular brand. Most users immediately complain that they feel different on their feet. If you’re one of them, do not be surprised. Orthotics, especially those with strong arch support are not that easy to adjust, and you may need to use them for a while before finally adapting to them. Until then, ignore the unusual feeling you get when using insoles and focus on running or walking in them. After a few uses, you will be able to adapt to them. As expressed multiple times in this article, you tend to ‘get what you pay for’ in the world of orthotics. Some users might want to consider buying a new pair of shoes rather than spending the same amount of money for insoles alone. However, some orthotics offers an excellent level of arch support that is non-existent in most shoes, making this investment worth it. Having the right kind of insole allows you to unleash more of your potential initially by the limitations that plantar fasciitis have brought about. By experiencing greater stability and comfort, you’ll be able to do more with less effort. What’s more important is you’re now able to do the things that you want just by wearing the right insoles! There you have it! Among multiple brands and probably hundreds of models to choose from, you now have the ten best insoles for plantar fasciitis. What’s left is to choose one or two from the featured products and see how you perform way better than before!